The Aerobie Sprint Ring features a compact, thin design that creates longer distance flights, traveling twice as far as most conventional flying discs! This flying ring is great for playing in the backyard, park, or school playgrounds. Stash it in your backpack for pick-up catch games with friends anytime. The open center allows each player to personalize their throwing and catching style catch the edge with your hand or use the center to catch it with your arm or foot. Create your signature moves with Aerobie flying discs! The Aerobie Sprint Ring measures 10 inches in diameter. Available in assorted neon colors. Sold individually. Note: This disc does not float in water. For kids age 7 and older. 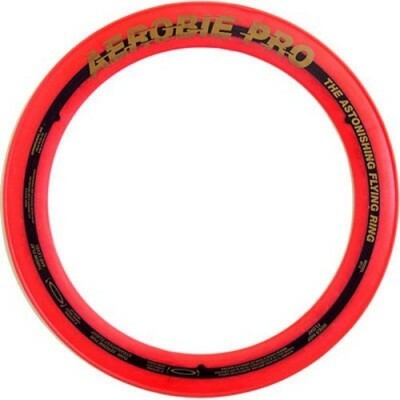 The compact, thin design of the Aerobie Sprint Ring flies twice as far as most conventional flying discs. Great for catch games in the backyard, park, or school playground. 10 inches in diameter – easily fits in your backpack.